Hand-to-hand combat (sometimes abbreviated as HTH or H2H) is a physical confrontation between two or more persons at very short range (grappling distance, or within the physical reach of a handheld weapon) that does not involve the use of ranged weapons. While the phrase "hand-to-hand" appears to refer to unarmed combat, the term is generic and may include use of melee weapons such as knives, sticks, batons, spears, or improvised weapons such as entrenching tools. While the term hand-to-hand combat originally referred principally to engagements by combatants on the battlefield, it can also refer to any personal physical engagement by two or more people, including law enforcement officers, civilians, and criminals. Hand-to-hand combat is the most ancient form of fighting known. A majority of cultures have their own particular histories related to close combat, and their own methods of practice. There are many varieties within the martial arts, including boxing and wrestling. Other variations include the gladiator spectacles of ancient Rome and medieval tournament events such as jousting. Military organizations have always taught some sort of unarmed combat for conditioning and as a supplement to armed combat. Soldiers in China were trained in unarmed combat as early as the Zhou Dynasty (1022 BCE to 256 BCE). Despite major technological changes such as the use of gunpowder, the machine gun in the Russo-Japanese War and the trench warfare of World War I, hand-to-hand fighting methods such as bayonet remained common in modern military training, though the importance of formal training declined after 1918. By 1944 some German rifles were being produced without bayonet lugs. Close Quarters Combat (CQC), or World War II combatives, was largely codified by William Ewart Fairbairn and Eric Anthony Sykes. 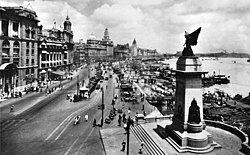 Also known for their eponymous Fairbairn-Sykes fighting knife, Fairbairn and Sykes had worked in the Shanghai Municipal Police of the International Settlement (1854–1943) of Shanghai in the 1920s, widely acknowledged as the most dangerous port city in the world due to a heavy opium trade run by organized crime (the Chinese Triads). CQC was derived from a mixture of judo, jujutsu, boxing, wrestling and street fighting. After the May Thirtieth Movement riots, which resulted in a police massacre, Fairbairn was charged with developing an auxiliary squad for riot control and aggressive policing. After absorbing the most appropriate elements from a variety of martial-arts experts, from China, Japan and elsewhere, he condensed these arts into a practical combat system he called Defendu. He and his police team went on to field-test these skills on the streets of Shanghai; Fairbairn himself used his combat system effectively in over 2000 documented encounters, including over 600 lethal-force engagements. The aim of his combat system was simply to be as brutally effective as possible. It was also a system that, unlike traditional Eastern martial-arts that required years of intensive training, could be digested by recruits relatively quickly. The method incorporated training in point shooting and gun combat techniques, as well as the effective use of more ad hoc weapons such as chairs or table legs. Other combat systems designed for military combat were introduced elsewhere, including European Unifight, Soviet/Russian Sambo, Army hand-to-hand fight, Chinese military Sanshou/Sanda, Israeli Kapap and Krav Maga. The prevalence and style of hand-to-hand combat training often changes based on perceived need. Elite units such as special forces and commando units tend to place higher emphasis on hand-to-hand combat training. Although hand-to-hand fighting was accorded less importance in major militaries after World War II, insurgency conflicts such as the Vietnam War, low intensity conflict and urban warfare have prompted many armies to pay more attention to this form of combat. When such fighting includes firearms designed for close-in fighting, it is often referred to as Close Quarters Battle (CQB) at the platoon or squad level, or Military Operations on Urban Terrain (MOUT) at higher tactical levels. 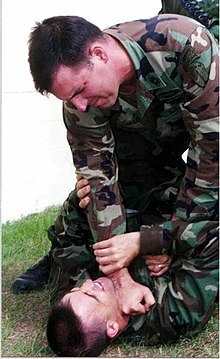 In 2002, the U.S. Army adopted the Modern Army Combatives (MAC) hand-to-hand combat training program with the publishing of U.S. Army field manual (FM 3-25.150) and the establishment of the U.S. Army Combatives School at Ft Benning, Georgia. The U.S. Air Force adopted MAC as its hand-to-hand combat system in early 2008. In the U.S. Marine Corps, Marine Corps Martial Arts Program (MCMAP) replaced the Marine Corps LINE combat system in 2002. Each Marine keeps a record book that records their training, and a colored belt system (tan, gray, green, brown, and black in order of precedence) is used to denote experience and skill level, similar to many Asian martial arts. The Battle of Isandlwana on 22 January 1879, the first battle in the Anglo-Zulu War, turned into close combat when the British exhausted their ammunition. It resulted in a decisive victory for Zulus over the modern British army. On October 22, 1986, during the Pudu Prison siege, the Special Actions Unit (special ops unit of the Royal Malaysia Police) turned to hand-to-hand combat, using batons and rattan canes, after the Malaysian Prime Minister ordered the resolution of the hostage crisis without the use of firearms. The result was a victory for the police, and the five prisoners holding hostages in Pudu Prison were arrested. Battle of Danny Boy took place close to the city of Amarah in southern Iraq on 14 May 2004, between British soldiers and about 100 Iraqi insurgents of the Mahdi Army. The insurgents ambushed a patrol of Argyll and Sutherland Highlanders close to a checkpoint known as Danny Boy near Majar al-Kabir. The Argylls called in reinforcements from the 1st Battalion of the Princess of Wales's Royal Regiment; the latter were also ambushed and due to an electronic communications failure it was some time before further British relief arrived. While waiting for reinforcements the British were involved in one of the fiercest engagements they fought in Iraq. The fighting involved close-quarter rifle fire and bayonets. The battle lasted for about three hours during which 28 Mahdi Army insurgents were killed; the British suffered some wounded, but none were killed in the action. ^ Kevin Brett. "History of Modern Reality Self-Defense and Close-Quarter Combat Systems". www.aikiproductions.com. Archived from the original on October 15, 2014. Retrieved October 12, 2014. ^ Michelle Tan (May 1, 2008). "Combatives Program wrestles toward permanency". Army Times. Retrieved October 12, 2014. Fleet Marine Force Manual (FMFM) 0-7, Close Combat, USMC, July 1993.